Check out the newest addition to our rec sites and trails – the Big Bear Viewpoint, which is located on the Big Bear forestry road. Head north out of Creston, resetting your trip meter at the Highway 3/3A junction (beside Tim Hortons), continue heading north on Highway 3A for 4km. Turn right onto Lakeview-Arrow Creek Rd. Keep right at the intersection at 5.3km. At 7.4km turn left onto the Big Bear Forest Service Road. Reset your trip meter here. Keep right at the 0.5km junction. At the 5.5km junction turn right. You will arrive at the viewpoint at 5.9km. 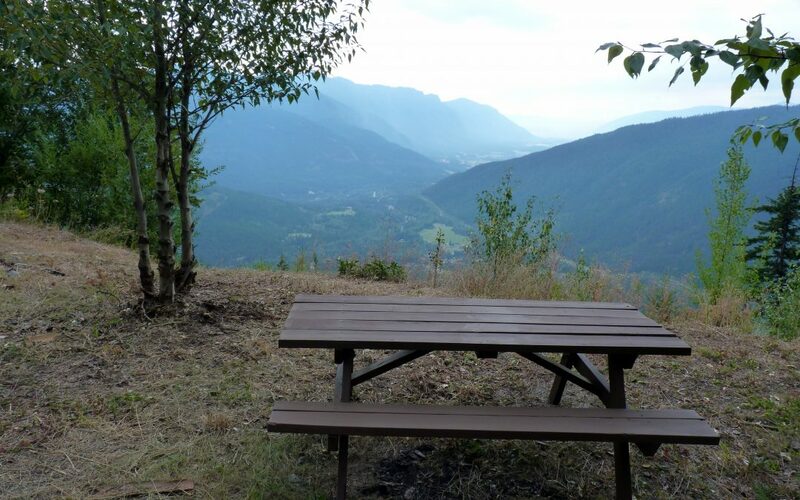 At the viewpoint you will find a picnic table and a short trail which leads down to a rocky viewpoint. The elevation of the viewpoint is 1380m (600m above the Lakeview-Arrow Creek Road). Views of Arrow Mountain, Thompson Mountain and the Arrow Creek Watershed, as well as the Creston Valley and south into Idaho.